A bobcat and a lynx are very similar-looking, medium-sized cats. Both look so much alike that it’s difficult to tell which one you’re looking at! This article seeks to highlight the main differences between these two magnificent, solitary animals. The bobcat is an aggressive, middle-sized North American cat that forms part of the four species under the Lynx genus or group. It has 12 known subspecies and can be found in Canada, the US and all the way to the northern region of Mexico. Lynx is a term that describes any of the four species that makes up the Lynx genus and can be found in Europe, Asia, and North America. This group includes the Eurasian lynx, Canada lynx, Iberian lynx, and the bobcat. 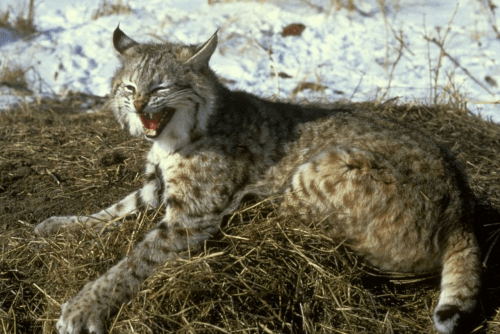 Although both animals come from the same group of middle-sized cats and thus, are closely related, a few important differences between a lynx and a bobcat can still be inferred. The bobcat is highly adaptable and lives in wooded areas, semi-deserts, forest, urban edges, and swampy regions. They are widely distributed and they range from Florida swamps, Texan deserts, and frozen Canadian mountains. The lynx, on the other hand, can only thrive in the heavily forested areas of Europe, Asia, and colder regions of North America. The bobcat looks a lot like other species in its genus, but is the smallest in its group. It has a tan to grayish-brown coat with dark streaks on its body and dark lines. The spotted patterns on its whole body act as camouflage. One of it’s more distinct features is its pointed, black-tipped ears with short, dark tufts. The rest of the lynxes in its genus share almost the same physical attributes although their coloring, paw size, and fur length may vary depending on their habitat. A female bobcat usually weighs about 20 lbs (9.1 kg) and males around 16 to 31 lbs (7.3 to 4 kg). The male Eurasian lynx is the heaviest, weighing in at about 40 to 60 lbs (18 to 30 kg) while a female is around 40 lbs (9.1 kg). 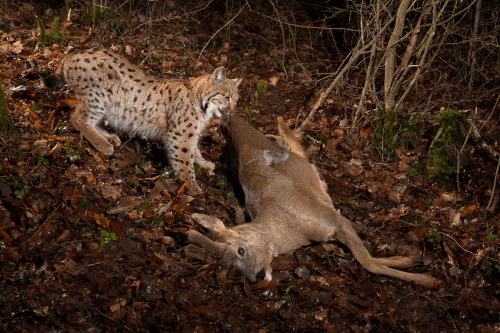 Bobcats are fast and resilient hunters. They feed on small mammals such as hares, rabbits, rodents, weasels, and sometimes eggs, fish, and birds. Lynx, because of their slightly bigger bodies, prey on slightly bigger animals such as reindeer, roe deer, white-tail deer, and chamois. They also feed on smaller animals including fish, squirrels, mice, snowshoe hares, turkeys and other small birds.